Today, we return to the hang gliding training hills. I am part nervous and part excited. I love the 7 seconds of flying when I launch properly, but I hate the race down the hill when I don’t. I’ve been getting better at launching, but not consistently enough that I feel confident I will get airborne every time. When we arrive at 7:30AM, it’s frosty out. The water puddles shine with a thin layer of ice. And there are plenty of puddles–there have been many rainy days of late. We assemble the gliders as quickly as we can, pausing periodically to warm our hands when they get so cold they refuse to work. I am wearing my hiking boots with warm socks, but my feet have solidified inside my boots before I’ve finished assembling my glider. I jump up and down to get the blood flowing back into my toes before finishing up and loading the glider on the trailer. As I stand on the trailer holding the nose of the glider, my feet slide across the wet metal platform I’m standing on. I realize that it, too, is covered in a thin layer of ice. I have to switch hands on the metal bar my glider is hitched to–my hand goes numb in a matter of seconds even with my gloves on. It’s hard to believe we’re South of home–or that it will probably be over 60 degrees today. The trailer bounces along the rough ground as we make our way to the small hill. We break through the ice on many puddles along the way. As we climb up the side of the hill, we leave a trail of mud in our wake. I’m happy to see the mud only because it means a softer landing than ground that’s frozen solid. As I get set for my first flight, I line up with a target that will take me to the right of two large puddles; the ice on their surfaces is just starting to crack in the rising sun. I tell myself not to worry about those puddles and to just stay focused on my target. I am relieved that I launch successfully. I launch, I fly straight, and I land on the wheels. It all goes quite smoothly. I seem to have learned how to keep my eyes on the target and how to let go when I launch. These are two key steps forward and I’m pleased that I’ve retained these skills since we last flew, which has now been three weeks. I take my second turn. As I launch, I get a bit of a cross-wind and I need to turn to get back towards my target. However, I move my shoulders instead of my hips, which pushes my feet the wrong direction and prevents the glider from turning. I actually have the wherewithal to realize I’m cross-controlling and to swing my hips over and turn the glider properly just before landing. I am ecstatic that I managed to have sufficient brain function to accomplish this. It’s the first time I’ve realized I was cross-controlling while still in flight. My confidence increasing, I line up for my third flight. The wind is blowing more from the right now. I point the nose of the glider as much to the right as possible, aiming for trees that will take me to the right of the biggest puddle. I get set, I launch successfully, all is well, and then, I have the realization that I am now headed straight for the giant, still melting puddle below. I panic. My eyes lock on the damn puddle below me. I try to tell myself to look back at my target, but now I am trying to remember how to turn at the same time. My brain does a complete scramble and by the time I attempt to turn the glider, I am completely cross-controlling. Then, it’s too late. Instead of turning, I land squarely on the near-side of the puddle and roll all the way through what must be a 20 foot wide puddle with at least 4 inches of water–perhaps a small pond would be a more accurate description. My chest is about a foot and a half above the ground and my belly and legs are dragging on the ground when I land. As a result, all the water plowed up by the wheels forms a wave that dumps directly up my nose, into my ears, and down the top of my waterproof jacket. My lower body drags through the water directly, shooting up a rooster tail that would rival a professional slalom water skier. I burst out laughing about half way through the roll, which results in muddy water dumping into my mouth as well. When my glider comes to a stop in the mud on the far side of the pond, I am laughing so hard I’m actually cackling. I see the entire landing in my mind as if I were one of the spectators up on the hill and I can’t stop laughing. This is a good thing because otherwise I might have noticed how cold I was. Cheryl, our friendly Kabota driver, pulls the trailer around and I set the glider on it, climbing on the trailer and grabbing the strap. Cheryl looks at me and asks, “Back in?” I give her a confused look. She tries again, “You calling it a day?” Surprised, I tell her I’m going back up for another run. If there’s one thing I know about trying to learn something new, unless you’ve really broken something, don’t stop on a low note. Stop when you’re starting to get tired, but you just had a really good run. She looks surprised and says, “Bless your heart!” as she turns to face front and starts back up the hill. The rest of the group at the top of the hill is serious. They all want to make sure I’m OK and not too cold. However, once they’ve established that I’m not hurt, not horribly cold, and still laughing, the jokes start. My husband describes watching the water and how unbelievably much water there was shooting up as my body drug through the pond. One of my fellow students who flies with a helmet cam apparently stood there watching and then quietly said, “Oh, damn. My camera’s not on.” I would love to have had a video or even a photo of that landing! I, of course, decided not to bring my camera today (the photo above is from earlier this year). Fortunately for me, I am wearing all hiking clothes. Everything I have on retains most of its insulating properties when wet and dries fast. The only exception is my waterproof boots. Funny thing about waterproof boots–they’re not so waterproof if you turn them upside down and drag them through water like you’re trying to scoop all the water out of a pond. And, because they’re waterproof, once you fill them with water, your feet are pretty much like goldfish in a too-small bowl. Fortunately, the temperature is going up, so I start warming up again almost immediately. However, I start having troubles launching on my next run. The pond is now occupying so much of my mind that I can’t keep track of what I’m doing. It’s like I went backwards 3 months again. The more I try not to think about that damn pond, the more I find it in my head. On my next turn, I’m determined to do better. I manage to launch, but then find myself flying towards the damn pond again. This time, I push my hips over hard, determined I will turn before I hit that water another time. However, turns out you’re not supposed to push your hips over; you’re supposed to pull. I think I knew this at one time, but I forgot. In any case, pushing lifts the nose and lifting the nose while turning puts the glider into a flat spin. Fortunately for me, I’m not far enough off the ground for it to be much of a problem. I make a hard right turn more or less straight for the ground. It’s not the kind of flight that makes me proud, but it sure beats another dunking. I struggle the next flight and the next as I try to pull my attention back from the pond. Each good flight is followed by a bad one. Finally, I decide I need to get one last good flight in and then call it a day. I manage to get my head back to this flight and this flight only. I launch, I fly, I turn without putting myself into a spin, and I land. It’s a good flight and it’s just in time–I am spent and my toes feel like reconstituted prunes inside my wet boots. All I can think about is how I need to find some shoes made for flying as I ride back towards the parking lot. 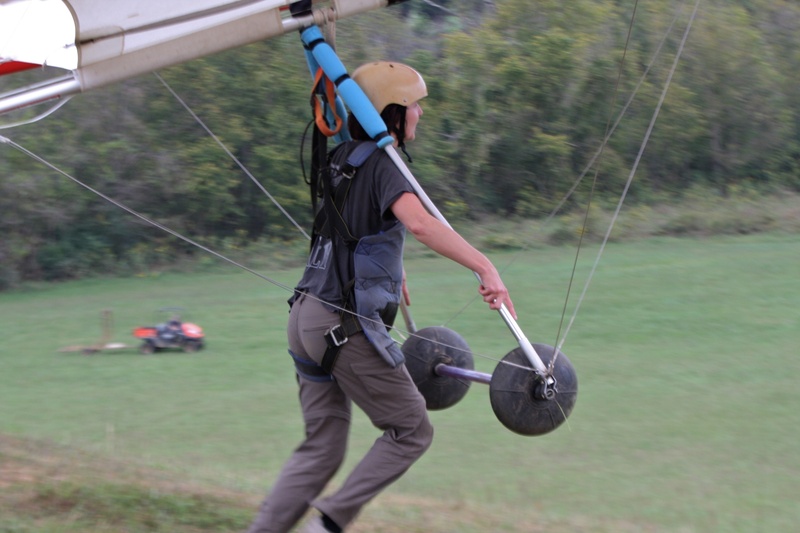 This entry was posted in Adventure, Chattanooga and tagged Chattanooga, Hang gliding, Humor, Learning to Hang Glide, Recreation. Bookmark the permalink.